With more than 350 exhibiting companies, 700 shippers and an expected attendance of over 5500, the networking opportunities are endless. We're looking forward to seeing you soon in Houston. Breakbulk Americas brings together shippers and suppliers in Houston, the oil & gas capital of the world. It’s all about new project opportunities from Canada to the Gulf of Mexico, down to the tip of Argentina and throughout the Caribbean. If you’re looking for new business, you’ll find it at Breakbulk Americas, Oct. 2-4, 2018. Breakbulk Americas’s targeted programming will ensure that you develop skills and strategy to help you do your job more effectively, while making industry connections that count. 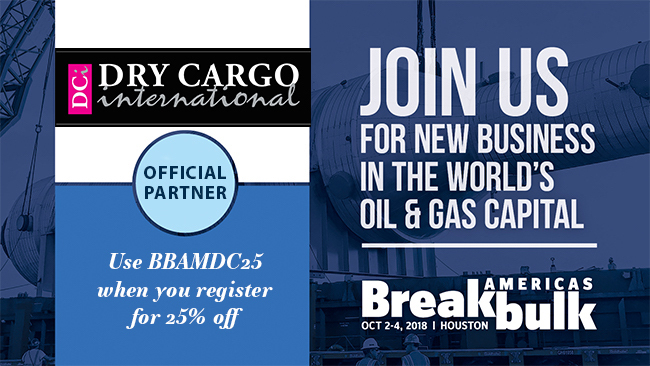 Breakbulk Americas is the place to connect with executives from leading EPCs, oil & gas and petrochemicals project owners, top industrial manufacturers, mining companies and metals producers who are moving cargoes throughout the Americas and around the world. Exhibitors and sponsors include specialized ocean carriers, freight forwarders, ports/ terminals, logistics providers, road, rail, barge and air transportation, export packers, equipment companies and more. With volatile trade markets, resurging projects and big infrastructure investment in Latin America, now is the time to get the business intelligence you need to be successful. Hear from industry experts during the conference sessions throughout the two-day exhibition. You can also take advantage of a two workshops designed to boost your skills in project freight management and global compliance. Experience everything that Breakbulk Americas offers your business.